OLYMPIA – State workers who refuse to join a union got their first paychecks Tuesday without deductions known as “agency fees” after a U.S. Supreme Court decision ruled they couldn’t be forced to pay them. But Republican legislators want the state to go further, demanding unions make it easier for workers to cancel membership or stop collecting any union dues unless employees sign new statements that they agree to have them deducted from their paychecks. Senate Minority Leader Mark Schoesler, of Ritzville, said he was concerned state workers’ requests to cancel their membership aren’t being properly handled by union officials. Schoesler accused the union of being “blatantly defiant” of the court ruling and using “guilt and scare tactics” instead of simply canceling the membership. “It is not the worker’s responsibility to track down a union representative in order to drop membership and stop fee deductions,” he said. The provisions for terminating membership in a union are already spelled out in the different bargaining agreements and the membership cards employees sign, Inslee spokeswoman Tara Lee said. She referred to a letter sent to Schoesler from Office of Financial Management Director David Schumacher that explains the state is calling for immediate renegotiation of dues deduction provisions in union contracts while ending the deduction of agency fees for nonmembers. The state has 4,975 workers of about 48,600 in jobs covered by a bargaining unit who have refused to join the union. Until the court’s Janus decision last month, they were required to pay a fee that represented the percentage of dues covering union services outside those that involve political activity. The court said those fees represent a form of speech, and nonunion employees can’t be forced to pay them without their consent. The decision came down in the middle of a semimonthly pay period, but the state canceled the deduction for the whole period rather than prorating it, said Franklin Plaistowe, OFM assistant director for state human resources. 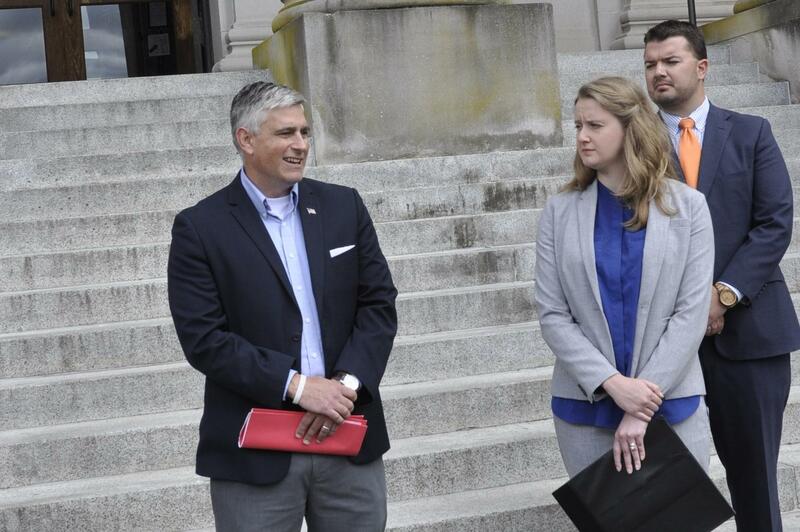 Sen. Mike Baumgartner, R-Spokane, joined the Freedom Foundation, an organization critical of unions, for a news conference Tuesday on the steps in front of the OFM, which handles the state’s contract negotiations. Baumgartner said he was sending a letter to Attorney General Bob Ferguson asking the state to require “affirmative consent” for all union dues. “I demand that you and the Office of the Attorney General immediately take action to enforce the Janus decision mandate to stop collection of union dues from workers who have not knowledgeably given a clear, written consent,” he wrote. Although state employees who join a union sign a membership agreement when or shortly after they are hired, the Freedom Foundation contends the state can only deduct union dues from employees who have signed since the court decision was issued. The organization threatened to sue if the state continues to deduct dues without getting newly signed membership cards. A spokeswoman for Ferguson said he has not yet seen Baumgartner’s letter, but the foundation is wrong about the court decision.